The Belt Line Railway opened in July 1892 to service the new neighbourhoods of Rosedale, Moore Park, Forest Hill and Swansea. A recession and competing rail services led to the railway’s closure only 28 months later. Parts of the railway were purchased and used by other companies over the years, but much of the old Belt Line sat abandoned for many years. In 1972, the city purchased a stretch of the railway east of Allen Road to create what would become the Kay Gardner Beltline Park. This is where the Central Ravines, Belt Line and Gardens Discovery Walk begins. 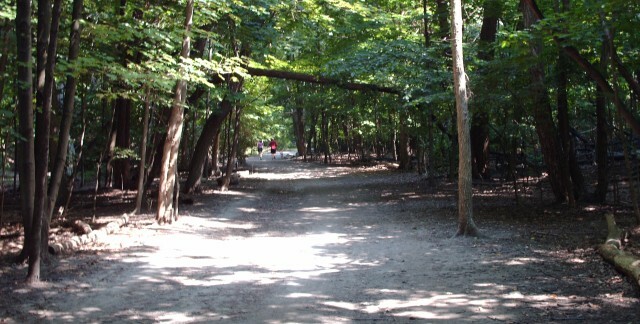 Starting just north of Eglinton West Station, the Beltline Trail follows the former rail line south, passing through several other parks along the way. After crossing a bridge at Yonge Street, the trail enters Mount Pleasant Cemetery. 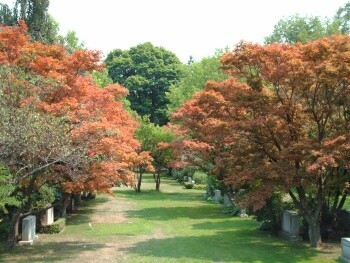 Torontoist never really understood the thought of a stroll through a cemetery to pass the time. Even on a bright August afternoon, Mount Pleasant looks like the setting for an old Anne Rice novel. After a while, though, the creepiness fades, the beauty of the place becomes apparent, and it’s easy to see why so many cyclists and ramblers explore Mount Pleasant’s winding trails. The cemetery is also an interesting look into the multiculturalism of Toronto, with crosses, Stars of David, Chinese dragons and other cultural symbols jumbled together. From Mount Pleasant, the walk goes down into the Moore Park Ravine, following Mud Creek. At Bayview Avenue, south of the Don Valley Brickworks, the walk turns, following the ravines north. This part of the walk is a bit more like a nature trail than the well-groomed Beltline Trail, so hopefully you’ve chosen your footwear accordingly. Following the Yellow Creek through the dense canopy of the Vale of Avoca Ravine, it’s easy to forget that you haven’t left the city. Heading out of the ravine and back into Mount Pleasant Cemetery, this Discovery Walk ends at Yonge Street, close to the St. Clair subway station. Although this walk is bounded by only a thin ribbon of trees for most of its length, this afternoon stroll feels like a total escape from the city. If you can’t remember the last time you heard the sound of water flowing over rocks when it hadn’t been previously recorded, give this Discovery Walk a try. The map can be picked up at City Hall, libraries and community centres, or downloaded as a PDF.